Sky view of the newly designed bar terrace. Today’s clubs are evolving to provide a diverse set of activities for all ages that reinforce family and social connection. From the re-imagined clubhouse, to the pool and wellness pavilions and the new kid’s camp, the Bridges redesign captures the busy and active lifestyle of its membership. Altevers Associates, (http://www.Altevers.com ) announced today they have been awarded the contract to complete a redesign and expansion of San Diego’s premier private country club, The Bridges at Rancho Santa Fe. Surrounded by rolling hills, the club is uniquely situated above expansive views of its proprietary vineyards, citrus groves and lush fairways. The redesign and expansion will take advantage of these views across the multiple venues that surround the property’s picturesque championship golf course, most notable for the seven bridges that link the course, and source of the club’s name. “One of the key objectives for the project is to provide a more contemporary, open, bright and expansive club for the members,” explains Robert J. Altevers, AIA, NCARB, founder and managing principal Altevers Associates. The current 35,000 square foot Tuscan-style clubhouse, first completed in 2000, has a dark, old-world country club feel, with many levels to the interior and exterior spaces that create furnishing challenges and servicing inefficiencies. Existing outdoor patios for each room are separated, lacking access for members to move from patio to patio outdoors. “Our plan is to create an indoor-outdoor experience that takes advantage of the stunning views and open-air California lifestyle,” Altevers continues. “Central to this experience is the circulation, to include the outdoor spaces,” he continues. To this end, indoor and outdoor spaces will be leveled, with outdoor patios contiguous to create a much-needed flow. Pocket and folding doors will be added to the clubhouse dining room, bar, entry, and event room, and what will be the new fitness center and luxury spa. Multiple outdoor lounges will be added, and existing lounges enhanced, with trellises, concealed lighting, wind screens and infrared heating to make them usable virtually all year-round. Aimee Altevers, director interior design, Altevers International, agrees. “Ultimately it is about the many experiences we create in each of the individual spaces to provide something special for everyone. There is a synergy and continuity that happens between architecture and interior design when we collaborate, that give our clients an end-product that is fluid, with even the smallest detail consistent with the overall direction and feel.” This is part of the magic that happens with a full-service planning, architecture and design firm such as Altevers. Fresh, light and bright are the adjectives Holt and Altevers use to describe the design direction. In addition to the clubhouse, the experiences they refer to will include the addition of a wellness pavilion that will be a two-story ground-up facility to replace the current fitness center. The pavilion will include a luxury spa, complete with five treatment rooms, all with private landscaped terraces that overlook cascading water features. Each treatment room has been designed to allow the full width of the room to open to the exterior and will support salon elements. The spa and fitness center will be positioned to take advantage of the dual elements of fitness and relaxation, utilizing the shared steam, sauna and whirlpool features as well as connecting to private gardens. The new fitness center overlooking the 9th hole and vineyards will have an expansive bifold wall system that opens to the fitness terrace. Movement, yoga and stretching studios will boast pocket doors that open to wraparound terraces and infinity-edge reflecting pools. The wellness pavilion is positioned to create a tranquil respite for members to relax and enjoy their private club in its picturesque, unparalleled setting. Additions to the pool pavilion will include private cabanas with a lawn lounge area as well as the expansion of the casual poolside grill, complete with a pizza oven and spa menu. A new kids’ camp adjacent to the pool pavilion will support activities for all ages – from toddlers to teens – and will open to a private terrace and enclosed field for play. View from one of the movement studios in the new fitness center.Pocket doors open to wraparound terraces and infinity-edge reflecting pools. 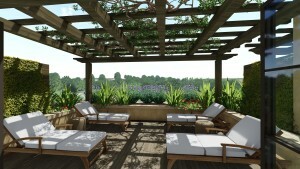 The new fitness-spa outdoor loggia.The wellness pavilion provides multiple views.